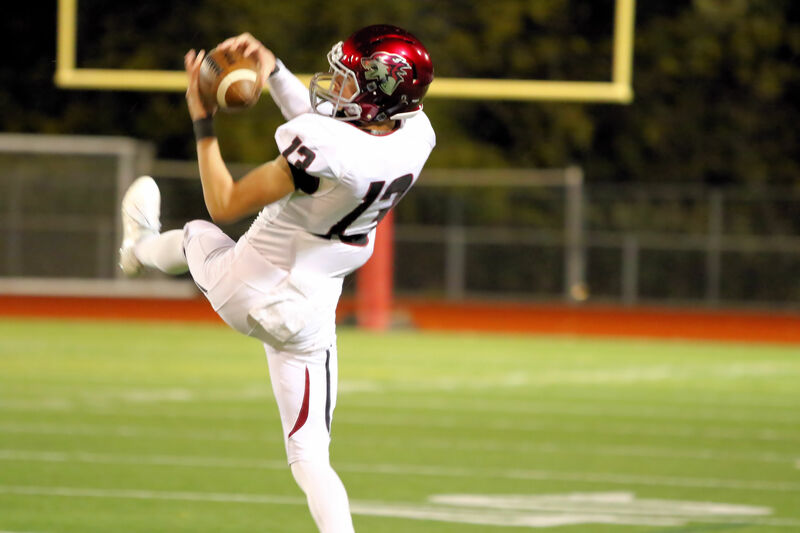 The Eastlake Wolves (ranked 29th in the state) traveled around Lake Sammamish through rain squalls to take on the Newport Knights (ranked 152nd). A dark, cold and rainy evening welcomed the Wolves and their fans to the Knights’ stadium. It was the Knights’ homecoming game and their band was playing their fight song to a surprisingly meager crowd as the players entered the field for the kick off. The Wolves kicked off and their defense quickly shut down the Knights, who had to punt after three plays. The Wolves took over on offense and wasted no time showing they were a much more powerful team. The Eastlake fans cheered loudly as Captain Daniel Bradley, returning after being injured for several weeks, took a handoff and gained 13 yards. Although Bradley would have success this evening, the night would belong to Captain Ben Howard. Howard, behind the protection of a strong offensive line anchored by Kyle Sihon, Captain Eric Plummer, Noah Morse, let loose his wrath (he would finish the night with 5 TD passes) and connected on multiple passes; Hank Pladson +15, Max Gardiner +5, and Pladson again for a 15 yard touchdown reception (Pladson would finish the night with 2 TD receptions). They missed the PAT attempt; score 6-0. The Wolves kicked off and Newport received the ball just 35 yards down the field. The Knights fared no better on their second drive. The Wolves’ defense shut them down; highlight for the Wolves was a big hit by Plummer who attacked and smashed the running back for no gain. The Knights got off a booming 56 yard punt on fourth down. The Wolves started where they left off and marched down the field. They showed the depth, skill, and multitude of threats from their backfield and receiver core as every player had big gains on the drive; Pladson +25 yard reception; Howard 6 yard QB keeper; Chris Nelson +4 and +8 yard runs; Bradley +4 yards; and Cole Brinkman had a 14 yard touchdown reception (he would finish the night with 2 TD receptions). Taige Thornton kicked the PAT; 13-0. Cameron Lynch showed he had removed the cobwebs after a one game absence when he kicked the ball 55 yards down the field. A Knight returned it 15 yards before being tackled by Avery Bosworth. This series was full of mental errors as the Wolves were penalized for a personal foul, the Knights were penalized for holding, the Knights threw two incomplete passes, and then the Wolves were penalized for encroachment. On the fourth play of the series, Jacob Mohrhardt rushed through the offense and forced the punter to scramble: he barely got off his punt which fell to the turf only 30 yards down field. The Wolves took over and Howard ran for 9 yards and then threw a 39 yard pass to Brinkman who caught it in the right corner of the end zone for a touchdown. The PAT was no good; score 19-0. The Knights returned the kickoff for an 18 yard gain. However, they couldn’t get anything going on offense due to the stout and aggressive Wolves defense. The key play of this series involved Plummer who blitzed through the Newport offensive line and pounded the ball carrier just as he secured a pitch from his QB. The Wolves continued to dominate on their fourth offensive series. They moved down the field easily and scored. Key highlights involved a roll out pass to Bradley, who caught it and ran an additional 15 yards downfield, then he took hold of a pitch and ran for 15 yards; and Pladson’s 11 yard reception which was followed by a 17 yard touchdown reception. Our 2 point attempt was no good; score 25-0. The Knights were forced to punt again after excellent defensive play. Top defensive plays included a big tackle by Ryan Stinnett that held the Knights to no gain, and great pass coverage by Pladson that ended in a 25 yard pass being dropped. The Wolves offense took over after the punt and didn’t let off the gas for several plays. It started with Nelson taking a handoff, breaking three tackles, and running 23 yards down field before being brought down. Nelson then caught a pass in the end zone, but it was negated by an offensive pass interference penalty. Captain Parker Lester caught a 6 yard pass on third down and the Wolves decided to attempt a field goal. The series sputtered to a stop as they missed it and the score remained 25-0. The Wolves defense dominated the Knights again on the next drive; Sam Milton made a nice tackle when the Newport QB attempted a keeper and the Knights punted again. The Wolves took over and marched down the field for a score behind the quickness of Nelson, who weaved through multiple defenders for an 18 yard gain, and the powerful running of Bradley who ran over and around offenders for a 27 yards gain and touchdown (he would also have a TD reception later in the game). Thornton made the PAT; score 32-0. The Knights had another dismal offensive series and the Wolves moved the ball easily down the field but the clock ticked to zero to end the half before they could get to the end zone. The Knights came out for the second half on offense and showed a little spark as they had a 10 yard run followed by a 5 yard run, but stalled and had to punt. Eastlake continued their offensive air attack as Howard connected with Brinkman for a 5 yard pass, Gardiner for 6 yard pass, and then Bradley for a 43 yard touchdown reception. The Wolves 2 point attempt was unsuccessful; score 38-0. The Knights woke up their crowd on their next series when they connected with their receiver for a 50 yard reception, but they had to settle for a field goal after they were penalized for holding and sacked; score 38-3. The Wolves put in their backup offense which struggled to get in a rhythm as the center snapped the ball high over the QB two times in a row, leaving them with a 3rd down and 47 yards to gain a first down. The Wolves QB threw a pass under pressure that was intercepted at their 50 yard line and returned it 15 yards before being tackled. The backup defense fared much better as Jacob McCommas tackled the Knights running back for a loss and a 31 yard pass into the end zone fell incomplete as they turned the ball back over to the Wolves on downs. Nelson dominated the next Wolves’ series. He carried the ball on all but one play gaining 11 yards, 12 yards, 11 yards, 6 yards, and then scored the final points of the night on an 8 yard run into the end zone. Thornton’s PAT was good; score 45-3. The Wolves Defense didn’t leave the Knights on the field very long when Gardiner intercepted their pass. The backup offense struggled again as the center snapped the ball high over QB Connor Brown’s head for a 22 yard loss. Brown kept the ball and ran for 12 yards on the next play. Then Andrew Plummer took a handoff and ran for 9 yards. He gained another yard on the next play, but that wasn’t enough and they turned the ball over to the Knights on downs. Newport couldn’t do anything offensively and turned the ball over on downs after several incomplete passes and a short run. The Wolves offense relied on young Plummer on the next series. Andrew gained 6 yards on his first carry (negated by a holding penalty), another 5 on his next, and then he ran over several Knights and dragged a few others for a 14 yard gain and first down. He then took a handoff for the last play of the game and gained 7 yards as the game clocked ticked to zero and the Wolves recorded their sixth victory of the season. 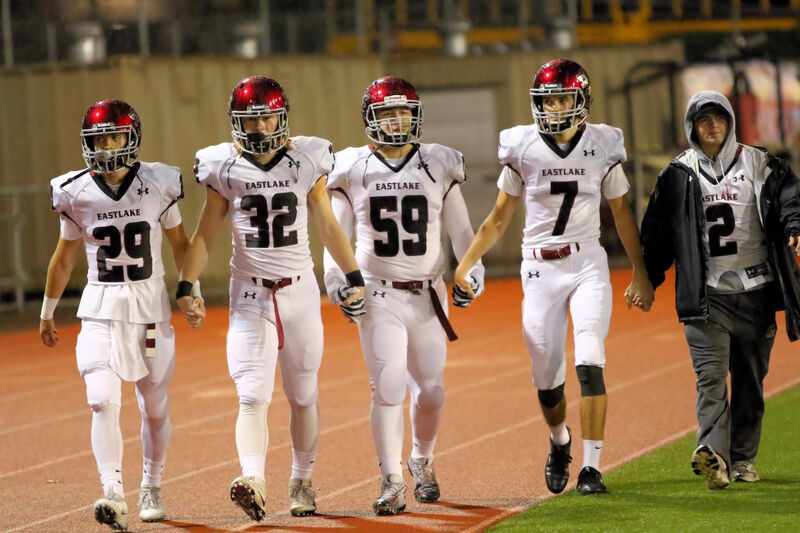 The path to the playoffs continues when the Wolves, celebrating Homecoming, take on the Issaquah Eagles (145th ranked) next Friday at Wolves’ stadium! The 1 and 6 Eagles have nothing to lose and that makes them dangerous as they look to put their talons into some Wolf meat. Thanks to Pat Howard for keeping statistics and to Cardwell, Mohrhardt, and Bradley for providing excellent photos.